Proper lighting has a direct bearing on the functionality of your kitchen. With well-placed sources of illumination, you transform your kitchen into a place where you can work, eat with your family or perform any other activity with pleasure and in comfort. If there isn’t enough light in your kitchen (if, for example, you have only one central lighting fixture), the atmosphere will be cold and unpleasant. In addition, the kitchen loses part of its functionality and some work places, such as countertops, sink, range, kitchen island… may fall into shadow. You have to install extra local lighting to cover these places. The most important for the functionality of your kitchen are general and task lighting, but for perfect illumination, try to combine all three types of lighting, using the advantages of each. This is the basic lighting in the kitchen; the one you turn on when you enter the room. The purpose of this type of kitchen lighting is to obtain a uniform spread of light in your room; that is to say, without dark or highly illuminated zones. The light must be sufficient for you to be able to move around safely in the kitchen, to arrange utensils in cabinets or drawers, to clean… activities for which you don’t need such precise lighting. pendant lights hanging from the ceiling. The number of lamps you will use depends on the size of your kitchen. If it is large and/or has a high ceiling, you will need a greater volume of light to illuminate the whole area well. This is a precise lighting that makes it easier to perform typical kitchen tasks, such as preparing food, cooking, washing and eating. Potential places for this type of lighting are countertops, sink, kitchen island and places for eating. As far as the range is concerned, you usually illuminate it from above, with light from the hood. You can light the countertops or the sink with lamps positioned under the upper cabinets. Fluorescent tubes are a good option for this, because of their extensive lighting surface. You can also add some extra lamps to the lighting for these places; for example, recessed or track lights. You place them on the ceiling, slightly in front of the upper cabinets. Concerning the island, peninsula, table or bar, one or more pendant lights will do a great job. Apart from adding a certain elegance, they also function as accent lights, turning these areas into pleasant, attention-attracting centers. 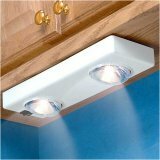 If you have any kind of shelving above your kitchen island, you can use the underside of the shelving to serve as a base for task lighting, for example, track lights, in order to illuminate your island better. This is extra lighting, which casts soft and tender light into the room; usually from lamps with lower voltage, for example, 12 volt halogen lights. Such lighting makes your kitchen more interesting and inviting. You can create the illusion of space in the kitchen by positioning, if you have space (at least 12 inches (30 cm) of empty space to the ceiling), lamps above the upper cabinets, directing them towards the back wall and the ceiling. If you have upper cabinets with glass doors, you can draw attention to their contents by placing small lamps inside them at either the top or bottom. This creates a wonderful visual effect. Another way of achieving this is by drilling holes in the bottom of these cabinets and allowing the light from the task lighting below to filter through. The types of lamp just stated are a small portion of a great variety that you can use. In addition to the type of lamp, you will need to consider the accent. You should be careful not to go too far with the accent; otherwise you will lose the effect. 1. Light switches: it’s good to zone your lighting; i.e., to be able to control it independently. For example, the lamp above the sink should have its own switch. The same consideration applies to the lamps above the island, table or countertops. 2. Light adjustment: it is good to use such systems everywhere you can. You can use them to modify the intensity of the light according your needs at a given moment; for example, when you have dinner, to reduce the light above the table and thus make the atmosphere cozier. Besides, by adjusting the lighting you save energy and prolong the life of the bulbs. 3. Reflection of light: light tones and shiny surfaces (on the walls and furnishings) make a room lighter, because they reflect a lot of light. By contrast, dark colors and matte surfaces absorb light. Therefore, if your kitchen is light and/or shiny you will need less light (for example, soft light from lamps with lower voltage or lamps with bulbs, covered with shades), than if it is darker and/or has matte surfaces. 4. Installation: to be sure of the quality of your kitchen lighting installation, I recommend that you employ the services of a professional. Click here for the best deals on kitchen lighting. I like the idea of using kitchen lighting for not just general and task-related reasons, but to also create some sort of ambiance in the kitchen that emulates high-class restaurants. Lamps Plus is a great store which provides great home decor lights at discounted prices by using Lamps Plus Promotional codes….. Pretty good article and nice examples here of kitchen lighting. Now I can go home later with some thoughts in mind for my kitchen! 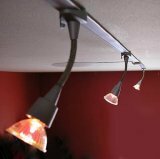 Here’s a suggestion for kitchen/living room lighting options–indirect lighting. This type of lighting is easier on the eyes and can really illuminate a dark room without harsh bright glares. The way this is best done in kitchens and dining rooms is with crown molding fixtures that are built to accommodate indirect lighting. It really infuses a beautiful glow in the room, making it feel inviting, elegant, and leisurely. Sufficient light source. We need to have the correct lighting at all the occupying spaces, so that we can be comfortable in doing whatever it is that we need to accomplish. Great information. Thank you for this. A correct lighting makes kitchen or home beautiful. I think single pendant lights are best for kitchens. Great information, thank you for this. As per my opinion, single pendant lights are best for kitchens.